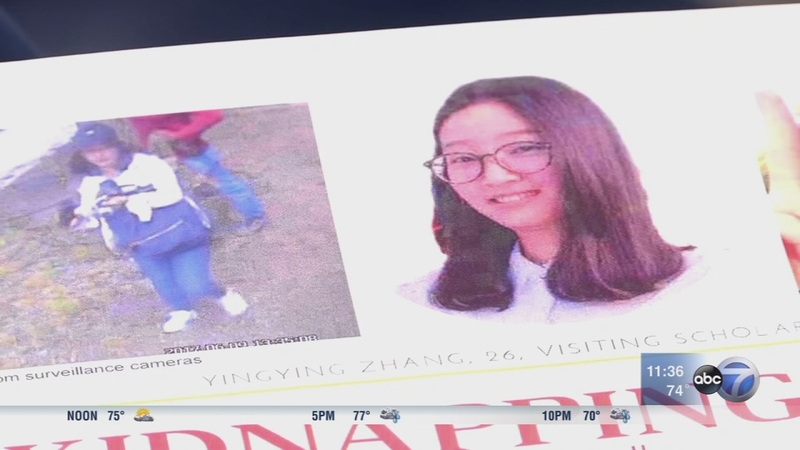 CHAMPAIGN, Ill. (WLS) -- Relatives of a missing Chinese woman studying at the University of Illinois say they won't leave the country without her as the reward in the case rose to $50,000. Family members of 26-year-old Yingying Zhang spoke Friday, pleading with the public for any information that might help find her. A Champaign man has been indicted on kidnapping charges in Zhang's disappearance and the FBI has said they believe Zhang is dead. Zhang's boyfriend, Xiaolin Hou, said the family holds out hope that Zhang survived until she is found. The (Champaign) News-Gazette reports Hou said they "want to bring her home." Family members spoke at a news conference where it was announced that the reward in Zhang's case has been increased from $40,000 to $50,000. It's the largest reward in Champaign County Crime Stoppers history. The man charged with kidnapping missing visiting University of Illinois scholar Yingying Zhang, 26, was denied bail in court last week. Brendt Christensen, 28, was ordered held without bond and was released into the custody of the U.S. Marshals Service where he will remain until his trial. Prosecutors said Christensen drove the black Saturn Astra Zhang was seen climbing into on surveillance video. Prosecutors said that while he was under surveillance, Christensen made statements indicating his involvement and, coupled with other findings, led law enforcement agents to believe she is no longer alive. Kidnapping charges were filed Friday, June 30. Christensen is a former physics PhD candidate at the University of Illinois. Federal prosecutors said in court Wednesday that Christensen was seen in attendance at a vigil in walk for Zhang that was held on June 29. Prosecutors also said in court that Christensen talked about "the characteristics of an ideal victim," said Zhang fought and resisted during the kidnapping, and threatened another person to whom he had made incriminating statements. Federal prosecutors said in the criminal complaint that Christensen had been under surveillance for nearly two weeks before his arrest. Zhang had been on her way to sign a lease at the time of her abduction, prosecutors said. Investigators believe she accepted the ride from a stranger because she was running late for that appointment. Security cameras captured the Astra stopping by Zhang as she waited for a bus near a campus parking garage. Zhang is seen speaking to the driver for a time before getting in the car. It was the last time she was seen.